When you camp in the winter, you can have the best campsites to yourself. Wildlife can be easier to spot and track, their prints visible in snow-covered landscapes. But you may exert more energy navigating in snow and burn more calories keeping warm in the cold. A hot meal revives you and gives you energy for the next day's fun. Princeton University estimates that a person on a winter backpacking trip needs 4,500 to 5,000 calories a day. Rick Curtis, Director of Princeton's Outdoor Action program, recommends that 50 percent of these calories be sugars and complex carbohydrates, 20 percent proteins and 30 percent fats. Fresh fruit and vegetables won't transport in winter and will freeze if not kept well-insulated. But cheese, butter and meat, foods that are more difficult to transport in hot summer months, do well in winter's cold. In very cold weather you may use more stove fuel cooking food, so opt for quick-cooking meals such as pasta, freeze-dried soups, instant oatmeal and beverages. A hot breakfast warms you in the cold hours of early morning and provides energy to start the day. Plan on hot drinks such as coffee, tea and hot chocolate. Instant oatmeal with an added protein such as chopped nuts or peanut butter stirred in makes a good breakfast. For car camping, meals such as pancakes and bacon give you the calories and fat to get going. Meat and cheese sandwiches or wraps make portable lunches, good for days spent hiking and exploring. Use bagels or tortillas instead of bread, which crushes easily. Cheese sticks, beef jerky and nuts provide protein and fat and are easy to eat on the go. Chocolate, which melts in the summer, keeps well on winter hikes. Gorp--good old raisins and peanuts mixed with chocolate candy--makes a portable snack you can mix up in quantity at home and eat throughout your trip. Brownies, candy bars, energy bars, cheese sticks, jerky and nuts all make good winter camping snacks. Dinner should be hot and a good balance of carbs, protein and fats to help you stay warm through the cold night. 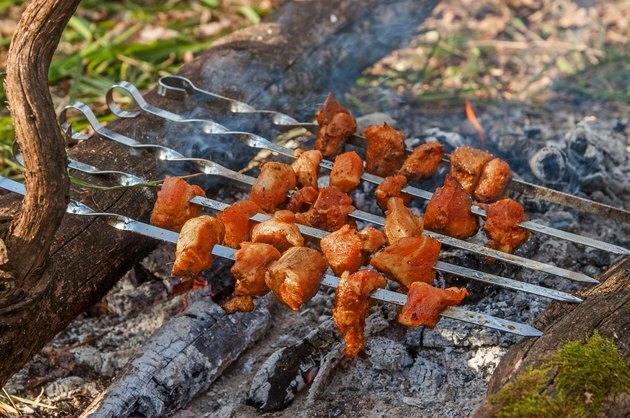 Reconstitute freeze-dried foods, or grill burgers or steaks over a campfire. Boil water when you get to camp and enjoy a hot drink while you cook your meal. Mixed boiled pasta or rice with cheese and packets of salmon, tuna or chicken for a filling meal. If you wake up cold in the night, Curtis suggests eating protein to help warm your body. He recommends tucking a sandwich or snack into your sleeping bag when you go to bed. If you wake up, you can eat this without having to get out of bed and chill your body further.